I can procrastinate a run like nobody’s business. This entire blog may exist as a tool to procrastinate leaving for a run. I am never as productive as I am when I have on a sports bra and shorts but have yet to commit to the socks and shirt. It is in those moments that I am seized by the need to empty the dishwasher, fold the laundry, return week old emails, maybe even prep dinner. Eventually I will run out of the kind of five minute chores that are perfect for putting off exercise. I will move as if through molasses to find socks and a shirt. This will kick off a new round of procrastinating, I may pay a bill or linger an extra minute or two in the living room wondering if this is the right moment to make sure that all the board games have the correct pieces. Finally, I will find my running shoes, not looking in the obvious places like by the back door or my closet, but I will start with someplace I never go like the upstairs bathroom. When I have checked under every bed and the linen closet I will run out of reasons not to grab my sneakers from the back door. I will tie them with the attention of someone who has only just learned to tie shoes. Sometimes I will even hear in my head, “the bunny goes around the tree.” When the shoes are tied I will pee for the 6th time in the half hour since I said I am going to get ready to go for a run. When I am out of excuses, when I have done every chore, when I am dressed and shoes tied, I will briefly consider calling a friend or making the kids dentist appointments for the next five years. But instead I will force myself out the door. The first few steps, from the door to the road are the hardest and most victorious. My body hurts a little bit; it takes a few minutes for it to catch on to the activity. But once I am out the door I will run, and as soon as I get past that initial tin man phase I will move into a space that feels like my favorite jeans. I am not especially fast, nor do I have good form, but when I go for a run I connect with my teenage self, my twenty year old self, my self before motherhood, and partnership. I connect with a part of myself that doesn’t really engage the world. Sometimes I daydream, and sometimes I just listen to the sound of my feet and my breath. Sometimes I think about things on purpose. I have made every major decision of my life on a run. 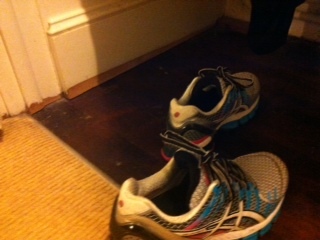 There is the moment at the end of the run, where I kick my shoes off by the door (so that tomorrow I can pretend to look for them) and I know that no matter what else I come up against in the day, for a brief period of time I existed only for myself. For some small part of every day we all need to engage in an activity, walking, running, sitting, swimming, anything at all where we just enjoy being with ourselves in our bodies with no agenda. Running helps to center me in my day and my life. No matter how outrageous the procrastination rituals may be I know that without that time every day I would start to feel unmoored. Every day root yourself somehow, even if it is hard to fit it in, even if you feel lazy, even if you have to make deals with God to get out the door. No one goes to bed at night wishing they had just hit “refresh” one more time, but plenty of nights I have wished I had carved out a little more time in the day for myself. Whatever it is, make the time, you won’t regret it, and besides, your chores might get done. Next postWhat are you packing? It’s so huge to be able to make some time for ourselves. I feel guilty sometimes when I do it, and I know I should not, but I do. The better we are/feel, the better we are for everyone around us. Great post! Thanks for sharing!